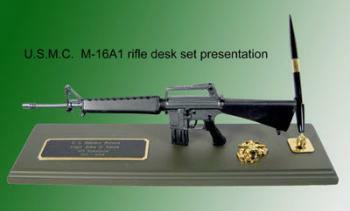 M16 A1 award presentation desk set [PLA-299M] - $179.95 : Metalcraft by Blair - military gifts and memoribilia. Another only by Metalcraft by Blair ( M-16A1 rifle as desk set with pen ) or with out pen your choice. We are offering a small miniature 1/3 scale M-16 resin rifle on a wood base with a pen -- this award presentation can be used as a desk set or as a table top presentation award or gift.. The gun is resin and measures 13" long --- the base is wood and is 16" x 4 1/2"